Check out today’s card featuring a Wood Wash Rainbow along with the Piece of Cake Bundle for The Card Concept Challenge #107! The new theme is Rainbow Cupcakes and checkout the inspirational photo below. I’m excited about today’s card and the Wood Wash that I’ve used. This card is inspired by the Wood Wash technique shared at the most recent North Carolina Stampin’ Up! Demo (NCSUD) quarterly held in Charlotte, NC. Want to try out a fun technique for a very cool and unique look? Then you must try the Wood Wash Technique! To create the background, I cut each strip is cut to 3/4.” The fun begins when you start adding ink to the wood textures DSP. From the top down, I used Balmy Blue, Coastal Cabana, Lemon Lime Twist, Pineapple Punch, Mango Melody, Flirty Flamingo and Highland Heather. Creating a Wood Wash really isn’t that difficult. You’ll need either a sponge or sponge dauber for each color you plan to used. To create the Wood Wash background, I used Sponge Daubers and dabbed them in the ink color of choice. Next, with quick strokes, I pulled the color in one direction following the grain of the Wood Texture DSP. And, repeated the process for each color and slat. Super easy and fun! I used Thick Whisper White as the card base! Select 7 colors and lightly add the colors with a sponge dauber. Adhere the strips to a piece of 3 3/4″ by 5″ whisper white and trim the strips to fit. Die Cut a Stitched Rectangle from Lemon Lime Twist Cardstock and stitched circle from Whisper White. Using the Piece of Cake Stamp Set, I stamp the cake and cake base. Create a template by first punching out a piece with the bundled punch. I use the negative to help me line up where to stamp. Use the punch to punch out the stamped cake. Color the images with Stampin’ Blends. Adhere Metallic Thread to the back of the cake then attach to the Circle. I then adhered the circle to the stitched rectangle. Attach the cake embellishment to the card front. Finally, finish by adding the basic adhesive-backed sequins to finish the card. Why not play along? Come on over to The Card Concept Challenge and check out the other Design Team Members cards. Then, head to your craft space and create a card. How does the photo inspire you? Give it a try. Love Paper Crafting? Getting a discount? Joining the Sunny Craftin’ Crew and Stampin’ Up! is the BEST DEAL of all! The Stampin’ Up! 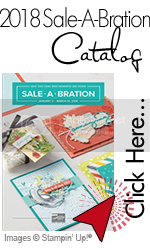 Starter Kit is the ULTIMATE Stampin’ Bundle. Start YOUR own business NOW! There’s no risk! Do it for FUN! Do it for YOU! Hobby Stampers are always welcome to join the CREW! I’m here to help you get started! And, for that reason, contact me today to learn more or click on the Join My Team to get started.